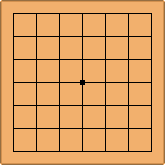 According to a Chinese-language article cited on Wikipedia, the 7x7 board has been weakly solved -- ie. not all legal positions have been analysed, but paths for Black to win the game against any defence have been found. 3. There are many ways to play that don't affect the result."